She lays the soft foam of her hair on pillows of stone. 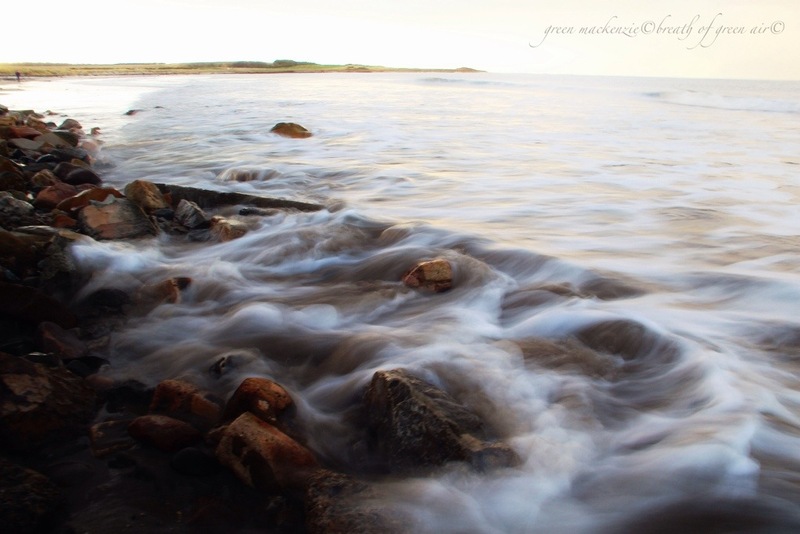 This entry was posted in elemental, mindfulness, nature photo, photos, relaxation, verse and tagged beach, mindfulness, nature, Ocean, photography, poetry, relaxation. Bookmark the permalink. I love your photographs! Serenity and beauty! Beautiful, creamy sea 🙂 Well done, Seonaid! Works so well together ! Beautiful photograph – I was wondering how you got that softness in the water over the rocks, but from other comment guess it is long (slow?) shutter speed. A bit special. One day I must look into these more esoteric ways of using the camera, if you can get such lovely effects. love that last line, especially! Thanks David, for me it’s usually the image which comes first…..from an experience in nature….the experience and the image from the words. To use the local vernacular (and I may have used this re: one of your posts before): Dang girl! Beauty! Glad you enjoyed it, I had fun playing around with the camera and some of the shots came out nicely for me…..many others were deleted! Beautiful photo, powerful imagery. I loved the way you elevated the ocean into a mystical being. Ah – I wouldn’t call it ‘romanticising’ if your intention was to belittle what you do! Just think how our distant ancestors (and our so called ‘primitive cultures’ today) give meaning to their lives in a way that we (well so called ‘civilised’ societies) think is just plain silly because it’s not explainable or understood. Oh dear – rant over! Mama Ocean looking serene, I hope she comes back south soon. I know, you guys have been seeing the rough side of her nature…..this afternoon was calm and peaceful up here on the East coast. I hope you are all surviving, and I’m certain she will show her soothing face again soon down in the south west. Lovely. That sea looks rather like silk. Thanks Sharon, and all captured without a tripod! Glad the words caught in your mind, they’ve been rolling round my head since Tuesday visit to the sea. Ooh I love it! I really want a set of graduated filters to do some long exposures of flowing water. You know I didn’t even use a filter for this shot, and in fact had even forgotten my tripod, so it’s a hand held shot which limited my settings! I was kicking myself as I can’t use my ND filter without a tripod, and I haven’t played with it nearly enough, but liked the way this shot turned out! Well done you!! Not easy to get that effect without filters and tripod! You must have very steady hands Seonaid.